I will never be someone who makes her own deodorant like Matt at DIYnatural, or who composts like Mrs. Money at Ultimate Money Blog. That means I won’t even attempt to create sunscreen from scratch. And forget about growing vegetables — the flowers I planted last week are already on their last legs thanks to the heat and my distracted demeanor lately. It’s not that I don’t appreciate frugality — I’m a fan of many frugal hacks (have you heard about my paper towel salvage project?). It’s more that I’m just not hardwired to be frugal 100% of the time. For example, when we have children, I’m pretty sure I won’t be one of the cloth diaper mommies. I did get some (minor) flack in the comments section about my paper towel usage. While some applauded my attempt to save the saturated roll, some also asked why I was using them in the first place. And I don’t have a good answer! We don’t use them that often, but I still could probably do without them 99% of the time. I mainly use them to dust, clean mirrors and wipe down stainless steel fixtures. They also make an appearance when one of the cats decides to present us with a hairball, which has been happening a lot lately. Perhaps I should look into phasing out the paper and using eco-friendly cloth towels — any suggestions? — Poor planning. Just today, I left the house to run errands without my coupons AND forgot my grocery shopping list. But I did absolutely need a few things, so I went to the store anyway. I tried to limit the damage by only using a small basket, rather than a cart, and I took the time to check if a certain brand was on sale. — I don’t always find the best price. Rather than trek to the mall, I bought a gift at a local jeweler because I’d rather give him the business. Could I probably have gotten it cheaper elsewhere? Sure. But I did accidentally show up while he was running a 20% off sale! — Convenience sometimes wins out. Mr. Saver is big on disposables — paper or Styrofoam plates, plastic cups, aluminum foil, and so on — which is something he picked up from his family. I have to pick my battles. I try to get him to use less of the foil, but he always rips these pieces that could cover half the state for the smallest thing. We’ll use paper plates for dinner once in a while. Plastic cups are reserved for BBQs and parties only. However, if there’s one thing that I am, it’s self-sufficient. I don’t need a handyman — this Saturday alone I managed to install a ceiling fan in the kitchen all by myself and repair the bathroom drop ceiling that was on the verge of collapsing. I can change the air filter and windshield wipers on our cars, replace a toilet seat and install sheetrock. I’ve created a cat door and put in new light switches. All of these things would cost major moolah if I had to pay a professional. I also like to thrift material things. I furnished my first apartment solely by cruising my neighborhood on bulk night (or after garage sales) and picking up pieces that were in good condition. I love to take a lonely piece of furniture that needs a home. I’ll reupholster a chair to get more use out of it. What I’ve learned is that I can’t do everything. Some people are born frugalistas. I’m a born do-it-yourselfer — it’s just in my genetic wiring, I suppose. I try to be as frugal and thrifty as I can so I’m not wasteful, but I’m sure I can do a better job at it in the future. Any suggestions for someone trying to be more frugal? Do you spend all of your time and energy on frugality? I’d rather pay an extra buck and save a few minutes of my life. We can all do better I imagine, but I watched my parents have absolutely no fun that cost a penny while growing up and decided there was no way I was willing to do that. (We’re talking living in a granary in the 1950’s.) So it’s all relative (literally!) since someone like my dad would consider the people that think they’re frugal to be spendthrifts. I truly think that those super-frugal people are sometimes slaves to money. Money is only a tool to use – and yes, even sometimes to buy happiness. What’s wrong with being proud or happy with a nice house, clothes, car or furniture? As long as you can afford it and aren’t living off of other people, it’s nobody’s business. On the counter, right under where the empty paper towel rack is, there is a little basket with a handful of bar towels. The napkin holder has cloth napkins in it now. The closet where the cleaning supplies are has old T-shirts and wash rags. It’s no fun depriving yourself! I don’t mind clipping coupons (my printer just ran out of ink I clip and print so many! ), I don’t mind buying the items on sale at the drugstore each week,and sending off my rebates. But – sometimes there’s something I’d really like to have… What’s the point of saving, saving,saving if you can’t treat yourself to something nice without regard to cost occasionally. No composting for me either. Or making my own soap or deodorant. I don’t have the patience for that stuff. I’m totally judging you! Not. It sounds to me as though you’re doing just swell. Give yourself permission to forget the coupons now and then. Then give yourself a pat on the back for saving a bundle on hiring someone to do the sheetrock. I like to use paper towels to clean my 3 toilets…washable cloths, YUCK! the do it yourself list could include, cleaning your own house (dusting, vacuuming) not getting a maid. washing your own car, not getting a $25 car wash. mowing your own yard vs. having someone cut it in 15 minutes…the list goes on and on. I love it that you are a do-it-yourself-er. You should try to get your own HGTV or DIY show! It sounds like you are being frugal by doing your home projects by yourself, and that’s amazing. I commend you for installing a ceiling fan on your own. I watched my husband and father-in-law struggle to install our dining room fan. As for the paper towel issue, I’ve cut down on my use, but still use them, especially for hairballs (one per day now! yuck.) Maybe you could use cloth bar towels for dusting and cleaning the fixtures. Cloth seems to pick up dust a little better, so you might find you prefer them to paper towels. @Little House: Our cats are on daily hairballs now, too. I do want to try the cloths for cleaning. I agree with you 100%. It’s not in me to be frugal with every area of my life. However, I am careful not to be wasteful. @Khaleef: It’s all about balance, IMHO. I agree that some people can carry frugality a bit too far. I also think that following budgets to the penny and writing down every single cent you spend would bore the bananas out of me. There are so many wonderful things going on in life that spending too much time just thinking about stretching pennies would mean missing out on a lot of fun and fascinating stuff. Definitely switch to cloth for dusting! I use rags and furniture polish to dust, and it works great. Still, don’t beat yourself up for not being frugal 100% of the time! It’s an impossibility! “I think I’m guilty of being unnecessarily hard on myself about being frugal because I know I can do better!” That just hits the nail on the head for me. I turn off the water while I brush my teeth and reuse plastic grocery bags. I also turn the A/C up when I can stand it and never leave a light or ceiling fan on when I leave the room. BUT, paper towels are like gold in my house. My Sham-Wow’s do not help much with dog accidents or drink spills. My husband is also a Charmin addict and that is not a battle I’m willing to fight. No, I don’t spend all my time and energy on frugality. I rather concentrate on living well now and until I kick the bucket. I could be more frugal but it is not for me. 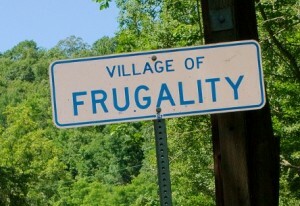 Frugality is not my life’s calling. You can get yellow microfiber towels at Costco – comes in a pack of 20 or something and are very inexpensive. Perfect for paper towel-type messes. We still use paper towels but have cut down on them significantly since we bought — seriously — some Sham-Wow! cloths at Bed, Bath and the Great Beyond. @Dan & Anon: Thanks, I’ll check those out. Hi! Frugality is not always easy and sometimes we deserve a little pampering! I think most of our dough goes on eating well. Re: paper towels – I laud your efforts. I’m anti-paper towel myself, but we always seems to have some in the house. @Tightwad: It’s true, we all need a little pampering! I tend to ‘splurge’ on stuff for the house, rather than myself. And I’d definitely like to cut down on the paper towels. @Mrs. Money: I think I’m guilty of being unnecessarily hard on myself about being frugal because I know I can do better!